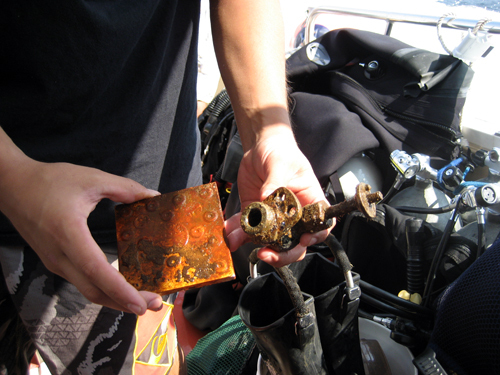 Justin’s tile and valve from the Stolt. 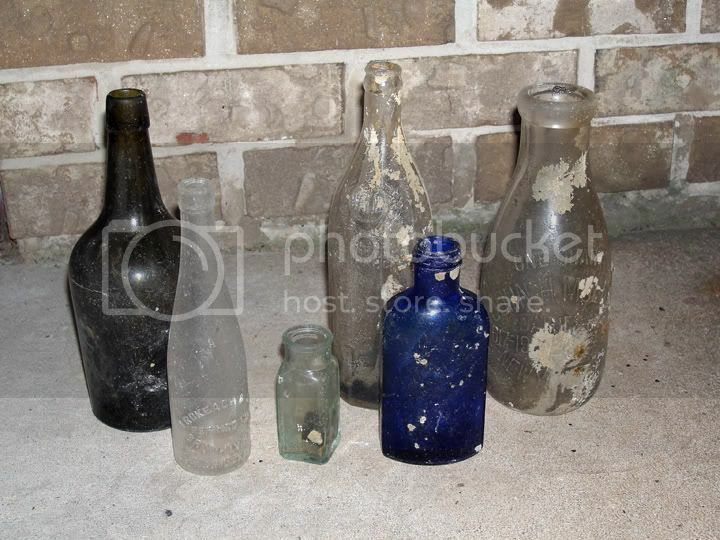 BAM’s bottles from the Immaculata. Rob brings back a memento from the Norness. 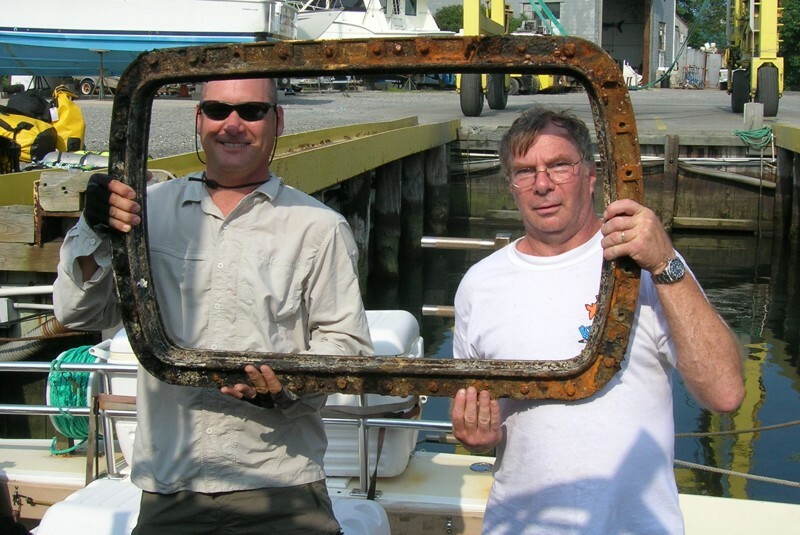 BAM’s porthole from the Oil Wreck. 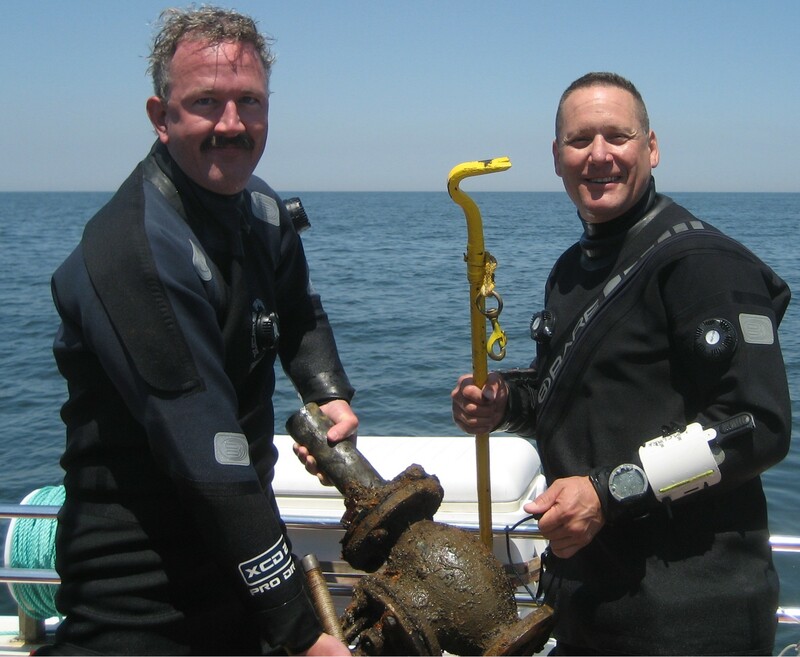 Dave, Mark and a heavy brass valve from the Pinta. Those are just the ones with pictures. The Mud Hole! Always known for bad vis, and difficult conditions. 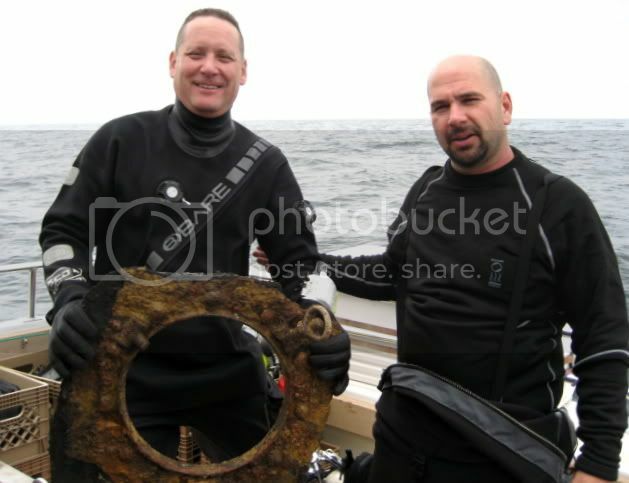 Today the intrepid divers of Adventure Scuba had the charter, and we headed out for the wreck of the Lillian. For those of you familiar with South Jersey diving, this is not the Southern Lillian. This is the real thing. The Lillian was as US freighter sunk in 1939 after a collision with much larger freighter the Wiegand. 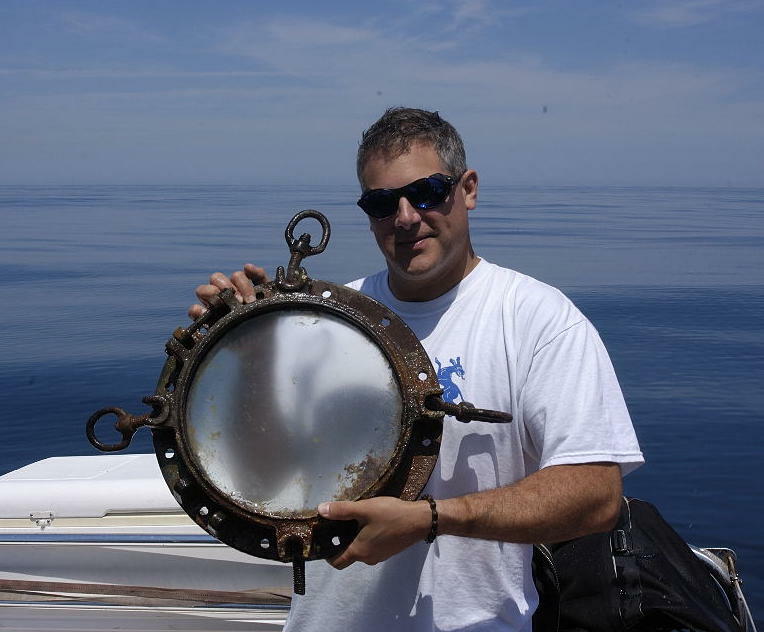 The wrecks is in 150 ft of water about 23 miles from the Manasquan inlet. Given the distance and the depth, she is not hit frequently. Given that she is in the outlet of the mud hole, the viability is often poor. Today was the exception! We left the inlet with the knowledge that the conditions were forecast to degrade over the course of the day. The plan was for one dive on the Lillian, then go in shore and hit the Arundo, in 140 ft just north of the mud hole. The conditions on the way out were favorable, and we made good time. I took the watch most of the way letting the rest of the crew sleep. Since I had students today, I knew I could not tie in, so it was the least I could do. When we hit the Lillian, the waves were 3-4, but the winds were 15+. This was going to built, but not too much yet. When Danny jumped in to tie, we could see that the surface conditions were clear, and the sun was clear above us. Since Captain Dan wanted to jump in later, I went in right away. We did our checks, and hit the water as soon as the pool was open. I did my checks and waited at 20 ft. We did our buddy checks and bubble checks, then quickly dropped down the line. At 70 ft we felt the thermocline, and the vis dropped off slightly. I switched my light on, and continued to drop. We hit the bottom in 150 ft of water. I was AMAZED at the vis. We had over 30 ft of of vis with reasonable ambient light. This was astounding to me. Every other trip here was in 10 ft of dark viability. I signaled Kevin to tie off a reel (practice and all). Then we headed off along the wreck. Most of what we saw was deckplates, and broken machinery. 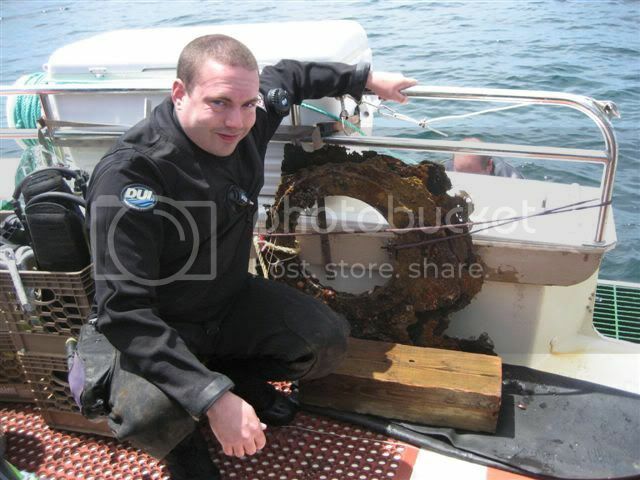 My intent was to take a tour of the wreck rather than look for anything in particular. In retrospect they would have been happy just getting scallops. We slowly covered the top of the wreck looking in each nook, taking time to understand what we were seeing. Along the way I stopped to pointed out a few lobsters, scallops, and a rather large monkfish. I also observed a few open holes where the portholes had been removed. Time grew short, or perhaps the better statement is the gas supply dwindled, and we turned on queue. On the way back I noticed from the empty catch bags, that neither one had capitalized on my birddoging. We returned to the anchor, and headed up at the designated time. Decompression was cool at first. I’ve become accustom to the 48 degrees we’ve enjoyed on the bottom since early August. Now the 46 degrees seems cool by comparison. The thermocline came into play quickly, as the vis expanded to over 100ft. We could now see the entire hull of the Indy above us while we finished our deco in comfort. While my students failed in the hunter gatherer portion of the class, many of the other passengers had recovered large quantities of scallops and lobster. There were also reported sightings of portholes, boilers, and assorted artifacts. I obviously had not made it clear that bribing your instructor with food goes a long toward passing! Once on the surface, we cleaned scallops and admired lobster, Captain Dan jumped in and did his dive. He pulled the hook, and Bill maneuvered to pick him up. Once up, he also commented on the amazing vis. I’ve only been here a few time, but his reaction speaks volumes. This was an exceptional day on the Lillian. When we tied in, I could tell that the wind and current were not aligned. When I splashed, I was quickly drawn under the boat, as the current was from port to starboard. While not strong, it’s never comforting to hang a few feet under the large props of the Indy. Again, once our checks were complete, we dropped down through the clear surface water down to the wreck of the Arundo. From previous experience, the vis is at best 20 ft. Today was about average. We hit the bottom, and I instructed Dave to tie off this time. During the ride in, they had expressed an interest in the hunter gather portion of the class. This was not the best wreck for the test, but here goes. We swam out looking for some sort of quarry. I’ve never found that many scallops on this wreck, so my concentration was on lobster. Investigations only showed a few tiny specimens. Peering under each plate only exposed a large population of eel-pouts. I tried my best to find some way for my students to prove themselves, but other than a few large tog, there was not much available. At one point I turned to see them collecting the large mussels connected here and there to the wreck. Some part of me was repulsed by the thought of mussels from the mud hole, but to each his own. We finished up our bottom time, and headed up the line. My bag was empty, but their bags were full of 6-8 inch mussels. We hit the surface, and headed back to shore. Kevin was cleaning mussels during the trip, while I tried to grab some sleep. It had been a long day, but a great day of diving! My God, Its full of stars! The other week we headed out to the U-869. I’ve been there a few times, and was looking forward to another great trip. When packing my gear aboard, I was informed that I was just needed for support, and I would be able to do a dive for fun. Sounds like a plan I can live with! In light of this plan, I opted to take the second watch. Brandon took first watch then woke me a few minutes early to let me wake up a bit. MY God! It’s full of stars! Quite simply, the sky is amazing out there! After the wake up call, (while Brandon was still at the helm) I went back to the cooler to grab my (now) ice coffee, and a snack. Looking up was just astonishing!!!!! I have no words to describe it. With the light pollution in the north east, we really can not appreciate the amazing canopy that is above us. 30 miles out, there is no other light, and the stars are a carpet of incomprehensible beauty. The constellations stood out so clearly, I felt I could reach out and touch them. Behind them was the often missed “milky way” which was visible as a blanket of soft but distinct lights. On course before us were Orion and the Pleiades. Both more pronounced that my home telescope could hope to show. I stood in awe for a few minutes, while Brandon kept looking to check that I had not fallen overboard. Back to work, time to drive! The eyes play tricks on you during the night. At one point I could swear a large ship was bearing down on us off the port bow, but nothing showed on radar. After a few moments of terror, I realized it was few clouds off on the horizon, just visible in the predawn light. While it was really on the horizon, it appeared to be right at our window. It’s easy to see how sea stories start. We approached our destination, and discussions of the days events were rehashed. Plans were formed and then reformed. After a few evolutions, it was revealed that I was tying in. So much for that fun dive, but such is the life! Danny and I geared up to splash. The line was in, but apparently there was some issue. It was pulled and dropped again. (Never a good sign.) We splashed to find clear water, and a moderate current. As it turned out the current went all the way down to the wreck. Since the shot was only a weight, any tension would pull it off the wreck. We had to swim along the shot rather than pull on it to aid our decent. After a few minutes of decent, the light dimmed, and I switched on my HID. 35 watts of bright blue light illuminated the surrounding area. However I could not see any indication Danny’s torch. I stopped my decent and looked up the line. There was no indication of Danny above me. Not good! The depth read 150, a long way to go yet. I continued my decent. Slowly the lights went out around me, but the current continued to keep the line just out of my reach. Deeper, deeper…. Only my lights and gauges were visible now. Deeper… deeper, there, what’s that? The line went off quickly forward. I could see the shot, but nothing else. It’s in the sand! Damn! I looked around, but there was nothing immediately in sight. The vis was good, but hard to tell the distance with nothing but sand. I tied off my reel to the shot, then headed off into the current ( the most likely direction of the wreck). After only a few seconds, I could see clam shells and debris, then the shadow of the wreck. I turned back to the shot. Danny could now be seen approaching, however he had no light. He was fiddling with something. Yup, his light had failed (one of those special buys from NESS). I returned to the shot, and proceeded to complete the task at hand, put a bag on it and shot it up. Once complete, I turned to see the Danny drifting off into the distance. He was being pulled by the drag on 300 ft of line, and drifting away from the wreck. After a quick swim, I grabbed the chain from his hand, and proceeded to walk it along the bottom to the wreck. We brought it to the top, and dropped it by a solid structure, then I signaled that I was going to look around. We were asked to tie into a clam dredge just off the starboard side. I quickly swam around the area, but could not find a dredge. I did find torpedo tubes which indicated that we were on the bow. When I returned I found Danny had wrapped the chain around the structure which turned out to be a bow winch. I guess this would have to be good enough, as the current would prevent us from moving the line much. I indicated for him to send up the signal. It had taken a while to tie in, so I only had a few minutes left. Previously while looking around, my every gaze had been met by sets of claws and antenna. For some reason there lots of large lobster on this wreck. With the few minutes left, I grabbed a few, and headed up. The vis had been great, and I was hoping to see more!!! Maybe I’ll get a second “fun” dive. The ascent was cool up to the 70ft stop where the water warmed up a bit. Then it was comfortable to the surface. The vis here opened up so that the anchor line and the entire hull of the Indy was in view. After boarding we helped the remaining passengers while the rest of the crew jumped in. Everyone talked about how great the vis was, and how nice the wreck was. I was not able to see much, but had to console myself with the fact that my lobster was the largest, and it was only a few feet from the shot line. On the way home, we all grabbed some sleep, and hoped for another day like this on the wreck. After a long summer of diving, Captain Dan offered a mid-week crew trip. He assembled the usual suspects and made plans for an offshore trip. Mother nature had other ideas, so we diverted to an inshore trip to the U.S.S. San Diego which lies a few miles off of Fire Island. With a diverse collection of rebreathers loaded aboard, we headed off. The USS San Diego was a WW I cruiser believed to have struck a mine back in 1918. The wreck now lies upside down in 110 ft of water. Since I’ve never been to this wreck I was looking forward to the trip. When we left the inlet there were 3-4 foot of chop with a long period swell underneath. Richie was kind enough to drive while the rest of us tried to catch some rest. By the time we reached the wreck the chop was dying down, but the swell was still apparent. When Brandon and Danny jumped in to tie in, they revealed a strong surface current. When they popped back up a few minutes later, they reported that the visibility could only be measured in inches, and the shot had been dragged off the wreck. Franky and Dan discussed alternates to the alternate, and we soon found ourselves headed for the Oregon. The Oregon was a English Luxury Liner sunk in collision back in 1886. The wreck lies a few miles west of the San Diego, but on a sandy bottom where the visibility should be better. Upon arrival, Richie had us tied in within a few minutes, and the pool was open. Bill and Ginny jumped in followed shortly by Capt Dan and Frankie. Brandon and Danny were waiting for Richie’s condition report before deciding on their dive plan. Given the delays getting into the water, and the long trip back home, I opted for one long dive. Richie surfaced with a report of surge and 15 foot of vis on the sand, better on the wreck. Brandon opted to leave the camera on board, and he and Danny jumped in. Once Frankie and Dan were back I jumped in also. Richie had us tied into a winch by the bow of this huge vessel. I tied off my reel and headed out. The first stop was the bow. 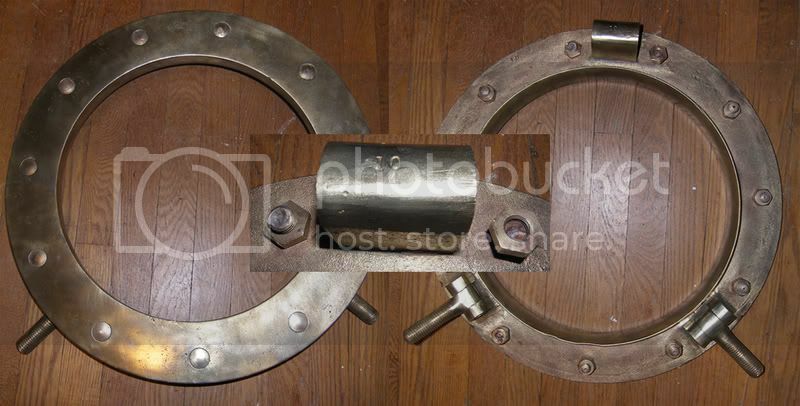 Here I could see a large hause pipe that once held one of the ship’s huge anchors. I doubled back and started heading aft along the starboard side of the wreck. On occasions the wreck appeared to be a jumble of deck plates in the sand. Here and there large portions of the hull loomed up off the bottom providing protection from the surge where the sea life would hide. The primary fish on the wreck appeared to be ling cod. They were all about, but most were small. Not the monster ling often found on deeper wreck. Here and there a flounder would scurry about in the sand, searching for food. Sea Ravens where well represented also. I don’t recall seeing that many on a wreck before. A few Tautog were about, but not many. After a bit of a swim, another large structure loomed up. This was more substantial than the hull sections I’d seen before. This was one of the ships massive boilers. With the short vis, I could not see them all, but Richie told us of the rows of boilers, 12 in all, standing up out of the sand. In her day this ship had set speed records for the trans Atlantic crossing. With these massive boilers, I could see why. I’d love to be able to seem them all at once, but even one at a time they’re impressive. After passing the first, I found that my reel was nearly out of line, and my Time To Surface was getting longer. I turned around an headed back. Here and there were the obvious holes that had previously held a port hole. I poked my light into a few hoping for a lobster, but came up empty. One hole caught my eye with a bright round image of china. About 2/3 of a plate was exposed. I tried to free it, but the ground around it was like cement. Tapping at the ground with my knife did not break up the material. It was solid, and that plate was not going anywhere. Probably for the best, as my time was short. By the time I hit the line, Richie and Frankie were on their way down. I started up for my long deco. During the whole deco time I could hear voices off in the distance. I later found out it was Richie and Frankie talking to each other. One of the advantages of CCR is that you can hear your buddy under water. Others say this is a disadvantage. Either way, it was entertaining. By the time I was ready to board the boat, I could see (and hear) them on the line below. Once aboard we pulled in the line and headed back home. The seas had calmed down during the day, so the trip back was smooth sailing. 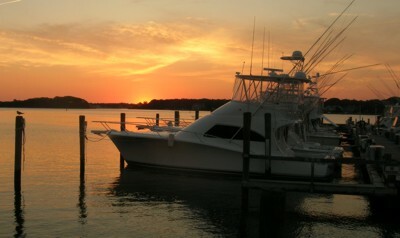 By the time we had the boat cleaned, the sun was setting over the bay. Just another great day of diving. Thanks Captain Dan!